Most people are familiar with the game animals in British Columbia, but not the vast majority of British Columbia’s small mammals that are not exploited for human use. Non-game organisms form the foundation for ecological communities, and these organisms cannot be ignored if we hope to understand population dynamics in British Columbia. 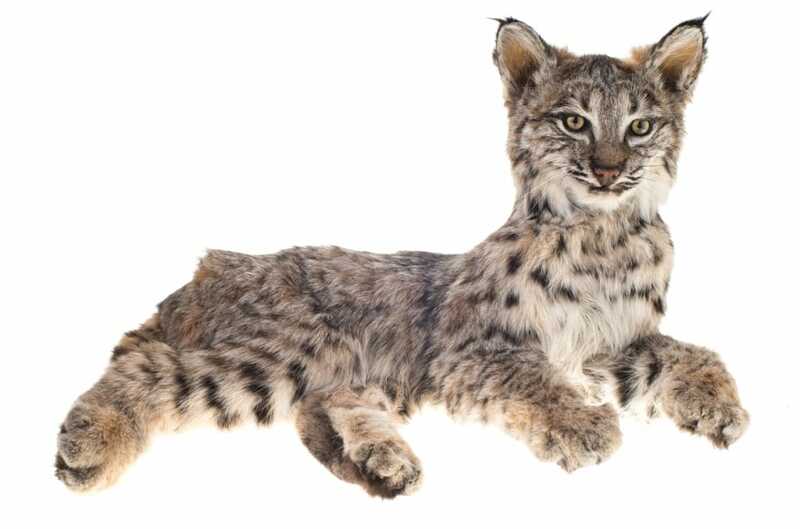 The Royal BC Museum’s collection contains over 101,861 vertebrate specimens, in a wide range of life-history stages from preserved embryos and neonate animals to fully adult individuals. About 346 species of mammals are represented in this collection, with more added every time researchers get out to survey new areas. The wet collection contains only a few alcohol preserved adult mammals and a range of embryos, including a few foetal whales and pinnipeds. Each jar in the collection may only house one specimen, or in other cases, the jar may be packed with a number of specimens caught at a particular place and time. Each specimen has a label with some collection data and catalogue number, and specimens are ordered in the collection according to a rough pattern of evolutionary relationships. Furs and some mammal taxidermy mounts are held in a secure cold room separate from the main part of the collection. The majority of the mammals in the Royal BC Museum’s collection are prepared as study skins and skeletons. These specimens are housed in steel cabinets, with disarticulated skeletal material housed in clear plastic Durphy boxes. 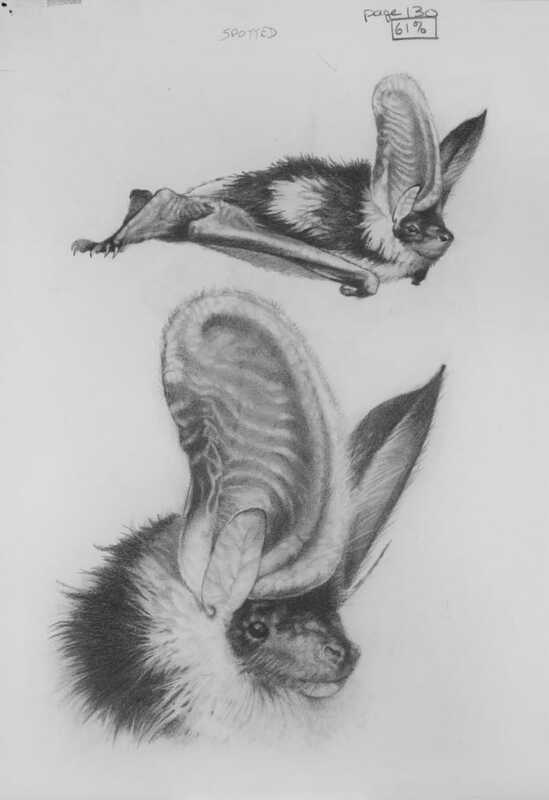 The unique specimen catalogue number is written on each bone if possible, although this is not possible for the smaller bones of bats, shrews and rodents. This collection contains many type specimens. Type specimensare the best examples of a species at the time a particular species was described. Better specimens may be found years later, but the type specimen designation stays with the original material used to describe a species. There are provisions for designating new type specimens if the originals are lost, but this is the exception rather than common practice. Most mammals in the Royal BC Museum collection are from British Columbia, but a small portion of the collection comes from outside our borders or exemplifies of closely related organisms for comparison. There are also several exotic species in this collection to document the continued presence of species introduced by humans for hunting, farming or from the pet trade. 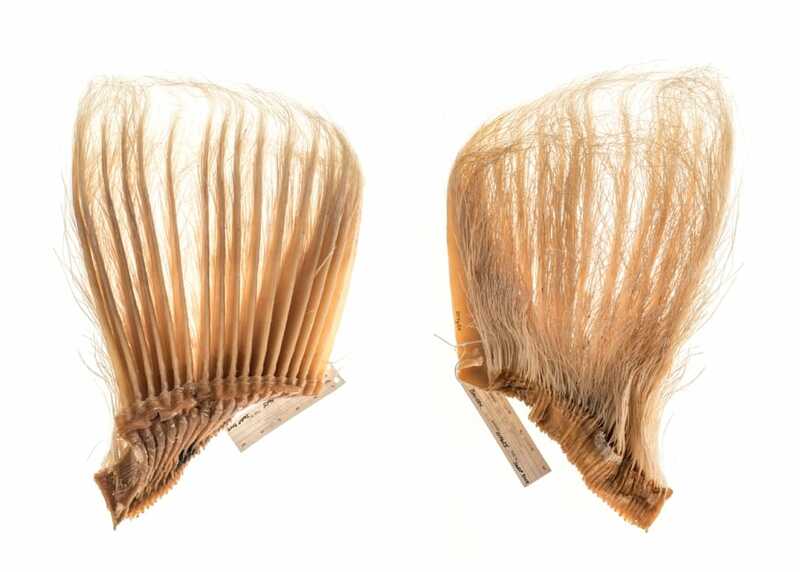 The collection does contain a small number of other exotic organisms that today would be rejected since they are not representative of British Columbia (e.g., a Cheetah skull; an elephant’s tail). Some specimens not representative of British Columbia have been transferred to other institutions. The vertebrate collection was likely the first to be established by Jack Fannin when the museum was created to stem the flow of artifacts out of province. New specimens are added each year, but this number varies significantly depending on the source. Small mammals may arrive as a group or as single road-killed animals. The Royal BC Museum has two new specimens of the latest mammal to be found in BC: the eastern red bat. The collection grows from research specimens and public donations, and from specimens transferred from the Department of Fisheries and Oceans, Ministry of Transport, Ministry of Environment and regional natural resources officers, as well as a wide range of other sources. Our collection manager for birds and mammals is Lesley Kennes. Preparation of mammal specimens in the backlog is being addressed over a 2 year period to produce study skin and process skeletal material for the collection (either by boiling to remove soft-tissue, or using dermestid beetles to clean away flesh). 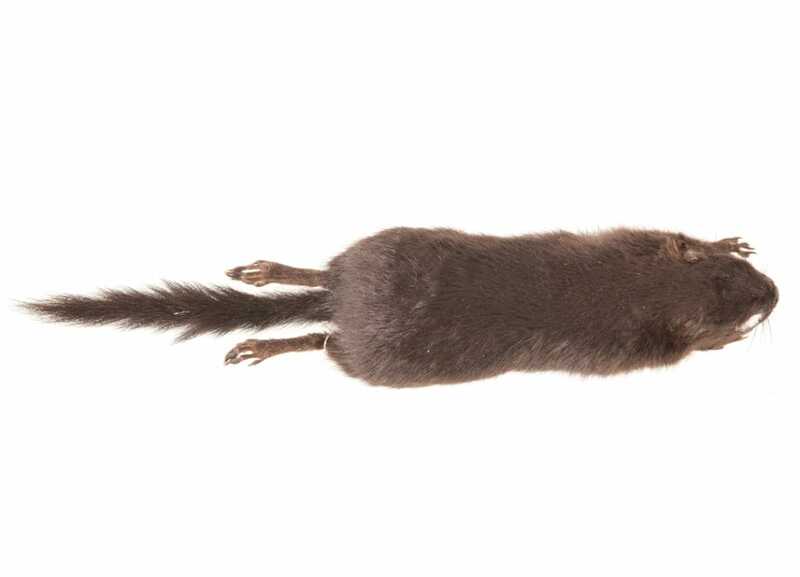 The mammal collection recently acquired two eastern red bats, a new species added to BC’s fauna, as well as specimens of the recently described Olympic Shrew. The mammal collection also includes a taxidermy mount of the extinct Dawson’s Caribou and several taxidermy mounts of Kermode Bears—including the type specimen used by William Hornaday in his failed attempt to define the Kermode Bear as a new species. In recent years, the emphasis has shifted to the collection of representative exotic species and we actively seek groups of specimens from researchers who perform geographically broad-scope studies. 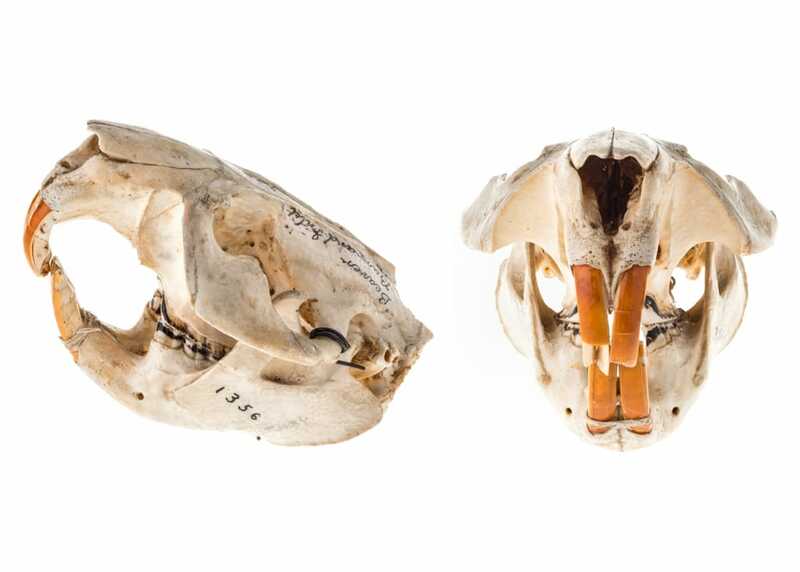 We also solicit specimens from regional Natural Resources offices to keep a flow of large mammal specimens into the collection, even if any given animal is represented only by a skull or pelt. 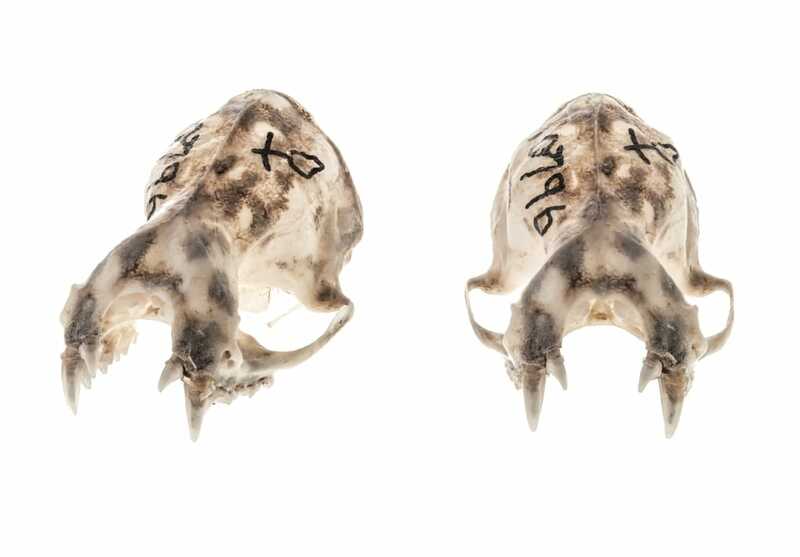 The mammal collection is frequently used by researchers from neighbouring provinces and states and from around the world for a myriad of projects ranging from stable isotope analyses of ecology, basic anatomy and systematics, to population genetics analyses. The collection’s greatest limitation is a lack of space to cover all major taxonomic groups. Additional room for at least another 200 specimens will be necessary in the next few years. The main part of the mammal collection is housed in cabinets on compact shelving, but these cabinets are nearly full with little room for expansion. Space to store additional baleen whale skeletons or killer whales on the present allotment of open shelving will also be a challenge. As is the case for all vertebrate groups, this collection is focused more towards organisms in the southern end of the province. We have many specimens from southern Vancouver Island, the Fraser River delta, and the Okanagan region, and comparatively few from the interior portions of the Fraser drainage, the Yukon drainage and the Mackenzie drainage. The collection also has few specimens from the northern coast and Haida Gwaii, primarily due to the expense of accessing these locations. The collection is particularly weak for large mammals because of limited collections in the last 20 years. Bears, pinnipeds, whales, dolphins and ungulates historically were collected by museum staff or sent to the museum for preparation by natural resources officers. Unfortunately in the 1990s, the museum lost contact with many of its original sources of specimens and now there is a substantial gap in the collection for many birds and large mammals. We now are trying to address this gap by soliciting specimens from Natural Resources offices and the Department of Fisheries and Oceans. The only mammal species in British Columbia that we lack is the Spotted Skunk—and Striped Skunks are rarely added to the collection, perhaps for olfactory reasons. By necessity, the mammal collection is biased towards smaller animals because of space and preparation limitations. We haven’t the space, staff or lab equipment to prepare many seals or sea lions, whales, or moose. The present complement of cabinets and shelves are nearly full. Additional storage cabinets and vats are required to allow for collection expansion. Our new focus is to more efficiently use space and try to make room for collection expansion within the existing walls of the Fannin Building. 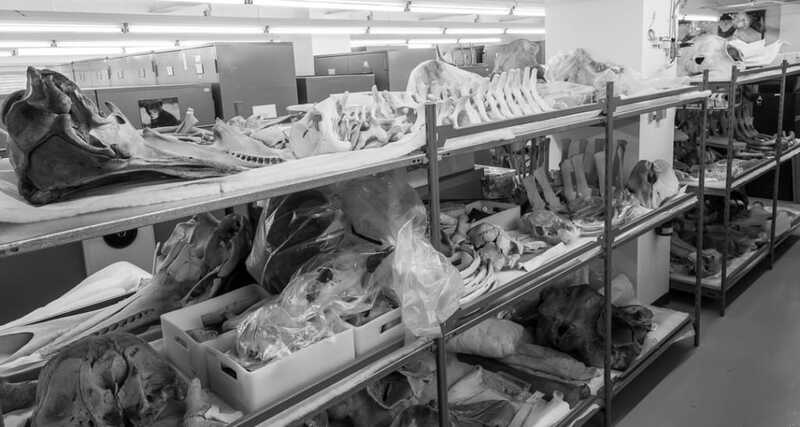 Future plans to transfer taxidermy mounts and education specimens to the Public Programming Department will clear space for more large mammals should we have the opportunity to prepare whale, seal or sea lion skeletal material. This transfer of education and display specimens also will allow us to move all cetaceans and pinnipeds into one space so that the marine mammals are together, which opens space in the main part of the mammal collection for expansion. Continued surveys are required to keep pace with changes in vertebrate populations, detect the presence of new exotics or expansion of the range of exotic species and keep track of changes to native species in this province—especially the non-game mammals, which tend to be overlooked. In an environment already heavily impacted by humans, it is difficult to justify collecting when species are already declining compared to historical levels, but we cannot protect what we do not understand, and we cannot understand that which we do not examine. Recovery of specimens from wind-farms, pest control, roadkill, Natural Resource offices and other sources is critical to maintaining a constant flow of specimens into the collection for future research projects because we cannot predict what future researchers will study. Granted, this biases the collection to areas near human activity, but in times of fiscal restraint, this will maintain a flow of specimens at minimal cost. Multi-staff sampling trips every 5 years will be really useful to get routine collecting effort across different regions of BC on a regular basis to limit temporal as well as geographic gaps in the collection. We also will continue to develop and maintain relationships with outside parties and the general public to ensure a continual flow of specimens and let people know the RBCM is still collecting and preserving natural history specimens. With the increasing popularity of genetics research, the Royal BC Museum receives frequent requests for tissue samples. New −80°C freezers installed in the wet collection in 2011 allow us to increase our relevance to the research community because tissue samples now can be taken and preserved. New mammal specimens will have a tissue sample taken prior to preparation of skin and skeleton. Government staff or contractors/consultants that collect specimens as reference material and vouchers should send their material to the Royal BC Museum. The museum represents a stable repository for specimens for future verification of identification and research. The museum also is actively soliciting specimens from the general public, even though collecting near urban environments biases the collection to places frequented by humans. These specimens, however, are valuable in that they document our impact on the environment. Good quality specimens should be forwarded to the Royal BC Museum as records of species presence and mortality in BC. Since 2008, the collection has received 46 lots of mammal specimens; each lot may contain multiple specimens needing preparation or preservation. The mammal collection relies heavily on donations from outside sources, with many specimens representing roadkill in urban environments, or pitfall trapped specimens (e.g., shrews).